This is a film about the redemptive power of rock and roll; it’s about the American South, where rock was born; it’s about a band straddling the borders of rock, punk and country; it’s about making art, making love and making a living; it’s about the Drive-By Truckers. This film documents the band and their fans as they explore tales of human weakness and redemption. With unparalleled access, this documentary encompasses three critical years of touring and recording as the band struggles to overcome trauma and survives a near breakup, in a persistent search for a happy ending. The Drive-by Truckers are one of my favorite bands and one that has had an impact on my life and how I look at my world. It is a love I share with the Husband. We saw this movie in a theatre when it came out to town, back in Houston. We bought a copy of it on DVD, too, and now I am in this writing class and working on a long essay about the Truckers and what they mean to me; so as research, we watched the movie again at home. Obviously and basically, I love the movie because it is a distillation of the band. The filmmaker was lucky to have the Truckers’ cooperation, and followed them to several shows, recording live footage; and interviewed all the band members repeatedly, as well as some of their families. Cultural authorities like a university professor (and obvious DBT fan) and music writer get screen time as well. This is a fan’s documentary, and I think fans can’t help but be pleased by it. Non-fans are liable to become fans… but then, I’m biased. I like that the movie captures a moment in the life span of this long-lived band, reviewing the early years (including the band Adam’s House Cat, where the two lead men, Patterson Hood and Mike Cooley, originally played together) and then getting into a few difficult years, when bassist Shonna Tucker and guitarist/singer/songwriter Jason Isbell divorced, and Isbell left the band. (He’s had an impressive solo career since. Look him up.) One of the things I’ve come to love about DBT is how many layers there are to love, investigate, and appreciate – like the people involved. The story of Shonna and Isbell breaking up is maybe none of my business; but you can bet all the band’s fans followed it and had feelings about it, nonetheless. For the record, I blame no one and wish them both the best. It’s a hell of a good movie, and even if you’re not a Truckers fan, I think it’s a fine documentary about rock-and-roll (and other things too). It pulls my heartstrings. I hope this is not too off topic, but I want to share a short piece that didn’t make it into my longer essay about the Truckers and their impact on me. I have a large tattoo covering my right arm and shoulder: a tree and its surroundings and inhabitants: fallen logs, grasses and flowers and mushrooms, a bunny rabbit, a snake, a squirrel, a turtle, a weasel, a fat yellow songbird. On the front of my shoulder, the tree’s branches part around a Cooley bird. Around the back of my shoulder, wrapping onto my back, a black owl with red eyes flies away, departing. It’s the same owl that my husband Chris has tattooed on his left bicep, flying above a leafless tree on a burnt yellow desert and under a spooky moon that looks down with knowing eyes and a slight smirk. These tattoos borrow images from Wes Freed, a Virginia-based artist who has drawn all the art for all the Drive-by Truckers’ albums, posters, website art, promotional material, backdrops, and etc. since time immemorial (or at least the Southern Rock Opera album of 2004). He is the band’s brand. 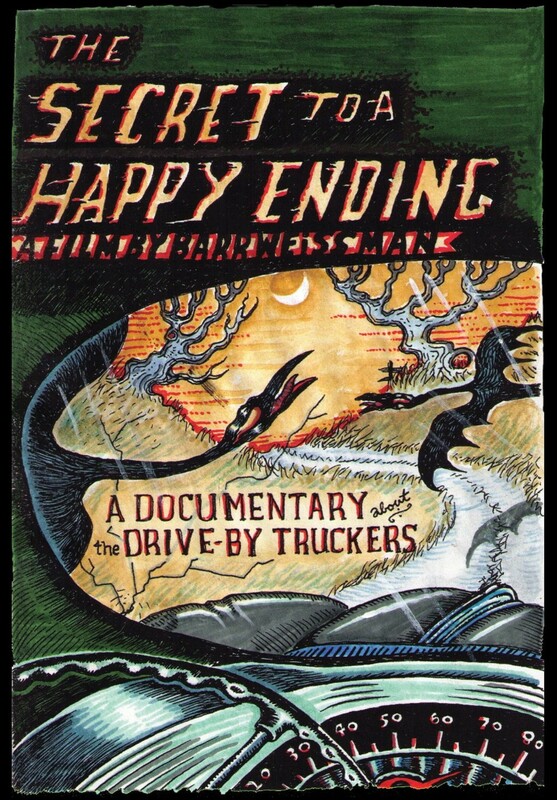 In a documentary about the Truckers called The Secret to a Happy Ending (whose cover art he also created), he says: “It’s always about the music. The music is the most important thing. But there’s so much going on with the records. It’s cool to be able to have the opportunity to illustrate the songs. That’s cool.” Wes Freed. I love that his named is a sentence: Wes Freed; or else a description: Wes, Freed. And the songs are themselves filled with dark and toothsome images. I did my own (very poor) copy of Freed’s illustration of “The Wig He Made Her Wear,” a song based on true current events in which a Tennessee preacher’s wife kills her husband: in court, her lawyers then displayed “them high-heeled shoes and that wig he made her wear,” as evidence of how abused she had been before she just snapped. Freed portrays a woman in a see-through negligee and high-heeled pumps, blue hair piled and stacked high, holding a shotgun whose smoke swirls around to caress her against an enormous yellow moon. A monkey in a fez cavorts behind her. I’ve looked and looked for Freed’s illustration of this song on the internet, but it seems to have disappeared; all I have is my poor imitation.